Wattisfield is a pretty village, although perhaps a little spoilt by the busy A143, which runs through just to the north of this church. The name of the village suggests a place where clay has been dug, and there is still a pottery in the village today. 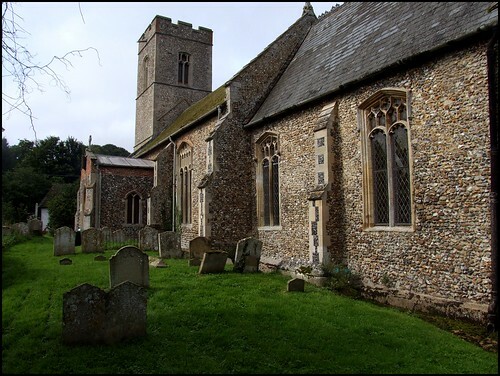 St Margaret is set in a lovely triangle, surrounded by fine half-timbered houses. A gorgeous ivy-covered Victorian former Rectory sits just to the south east. The churchyard is raised up above the road, suggesting that the highway has cut down over the centuries, and that this is an ancient place. Reflecting this, the tower is a bald example from the 13th century, but it has had narrow Perpendicular windows set into it. And, although much of the tracery in the church windows has been renewed, their shape dates them from this same late medieval time. The open north side of the churchyard is neat, with lots of interesting headstones. A path leads up to the simple north porch, an unusual wooden survival from the eve of the Reformation. The north side of the church, which faces the village street, is perhaps a little stark, and is more impressive than beautiful. But if you wander around to the south side of the church, you find that here, in complete contrast, there is an elegant and ornate south porch. It is a 15th century festival of knapped flint and red brick, with Marian monograms, an angled sun-dial, and a terracotta shield denoting the de la Pole family, who had it built. It speaks of something beyond the functional, beyond the merely necessary; ironic, as it is no longer in use. The graveyard this side is a riot of overgrown tombs, an absolute delight. Mortlock and Cautley found little to say about the interior of St Margaret, which is almost entirely of the 19th Century in character. The high-pointed chancel arch lends a sense of elegance, and everything is neatly kept and obviously well-loved and used. The 17th Century font cover has eagle heads, which give it carachter, and the late medieval font beneath it has blank shields which were probably painted once. The Victorians reused some of the woodwork from the old screen in the prayer desk. But even if there are no significant historical features, I still love to soak up the feeling of a place where, in Eliots words, prayer has been made valid. Here, over the centuries, this community has worshipped God in different ways; but it was always the same community, always the same God. I love stepping into that sense of continuity.